Gerry Barnes in association with Decadent Theatre presents Martin McDonagh’s A Skull In Connemara, directed by Andrew Flynn. For one week each autumn Mick Dowd is hired to disinter the bones in certain sections of his local cemetery, making way for new arrivals. As the time approaches for him to dig up those of his own late wife, strange rumours regarding his involvement in her sudden death seven years earlier begin to resurface... Nosey neighbours, troublesome teenagers, and an ambitious Garda contribute to this dark humoured play. Winner of the Evening Standard and George Devine Awards for Most Promising Playwright 1996, Martin McDonagh’s brilliant black comedy, A Skull in Connemara is one of McDonagh’s funniest plays. Nominated for an Olivier award in 1997 the play is guaranteed to make you laugh, squirm, and avoid graveyards! 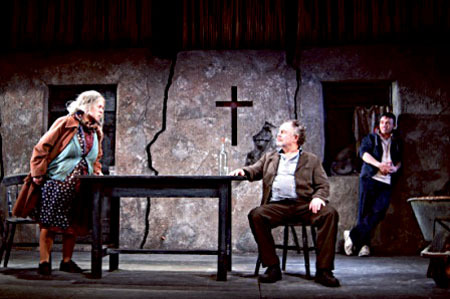 Martin McDonagh’s A Skull in Connemara is the sister in the Leenane Trilogy, the play’s older and younger siblings are The Beauty Queen of Leenane and The Lonesome West. Fans of Martin McDonagh’s movies (Seven Psychopaths and In Bruges ) are in for a treat with this superb theatrical masterpiece. This show is simply not to be missed! A Skull in Connemara by Martin McDonagh and produced by Decadent Theatre comes to the Dean Crowe Theatre, Athlone on March 25 and 26 (early booking is advised as viewing is restricted from some seats ). New Conal Gallen play will have you laughing!